Marie lives in Lambertville, New Jersey (USA), with her two dogs, George Eliot and Henry James, who — in spite of their snoring and a tendency to sniff horrifying things — are very good company (and endure Marie’s insistence that they love being kissed on their snouts). 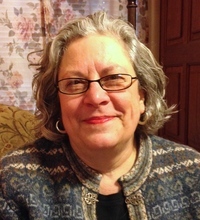 Mar Marie lives in Lambertville, New Jersey (USA), with her two dogs, George Eliot and Henry James, who — in spite of their snoring and a tendency to sniff horrifying things — are very good company (and endure Marie’s insistence that they love being kissed on their snouts). Marie has a daughter she adores, who is a doctor in Seattle. Marie is currently writing the second book in her Secrets of Farbookonia series: The Quest for Normal. To ask Marie C. Collins questions, please sign up. I think of “writer’s block” as something much more serious than the phenomenon I usually I hear writers talking about. For me, “writer’s block” is a paralyizing byproduct of things like grief, trauma, or depression, and may render a writer unable to put pen to paper for years. But having said that, I also think that we who are lucky enough not to be suffering – at this moment – from that brand of writer’s block still struggle from time to time with thoughts that won’t pour when we want them to. Writing ourselves into a corner can bring it on, but so may a wound to our confidence, lack of sleep, or simply asking too much of ourselves. I see that as a normal part of who we are – and of being human. There was a time when I would chastise myself for being unable to perform on demand, but not once did that solve my “problem” until it was ready to be solved – it just made me feel bad. We are not robots: We can’t write day in and day out without breaking down. Other needs push their way to the top of our to-do lists, other people and issues claim our minds. It’s this very humanity that we call on to bring depth and understanding to our creative work, so why deny it in ourselves? 1. If I can identify a problem, I step away from the draft and analyze it. For example, if I’m at a plot crossroads, I might break out a graphic organizer to map where I am and see if I missed a turn, forgot a character, or can move the story forward another way. Or I might wrestle with it in my journal by asking myself questions that get at the core of the problem until I find one I can answer (and thus start digging myself out of the hole). Journaling can also help when the problem has to do with wavering confidence. Regardless of what caused it, spilling it on paper can help me reground myself. 2. If there’s a more global cause – like a cold, or lack of sleep – I try to do something else. For instance, if I’m not up to writing, I may try outlining. If outlining is beyond me, I may update the documents I keep as a record for later books in the same series, or work on marketing materials – say, the book teaser or synopsis. These days we writers wear so many hats there’s bound to be one wearable one, even on bad days. 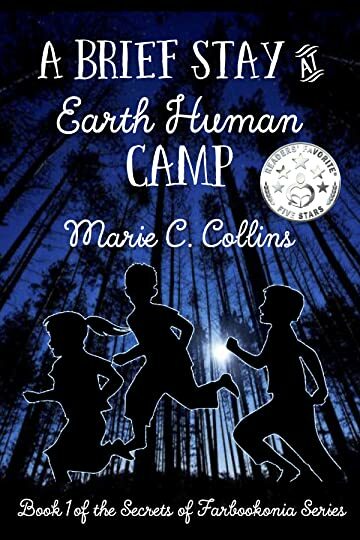 Put some summer-camp adventure in your back-to-school reading with "A Brief Stay at Earth Human Camp"! I am giving away 10 signed and dedicated copies to take the sting out of summer's end (U.S. only). We’d love your help. Let us know what’s wrong with this preview of The Revere Factor by Joyce McPherson. We’d love your help. Let us know what’s wrong with this preview of The Pandora Device by Joyce McPherson. Tormented Soul, book 1 of the Storm Trilogy, is the first book I’ve read about fae and their world. While I agree with another reviewer who said “the novel should have gone a couple more rounds of editing,” I based my star rating on the strength of the story and characters, which are appealing enough that most young readers won’t be bothered by that. Rhea is a strong storyteller. Her characters are vivid and clearly drawn, and they evoke strong responses in the reader, depending on the parts they play. Rhea’s dialogue is conversational and reflects her characters’ personalities. Her pacing is just right. And she advance her plot even-handedly. Kaden, the main character, is someone you might want as a friend — especially if you go missing the way Kaden’s best friend Megan does. Kaden searches for Megan desperately throughout the book, along the way encountering an assortment of both dark and light fae characters. A second strong character is Finley, a fae outsider who the reader eventually learns was once more strongly connected to the fae community. He reluctantly becomes Kaden’s wingman, helping her penetrate the fae world to search for her friend. We’d love your help. Let us know what’s wrong with this preview of Tormented Soul by Dylann Rhea.